In grades Pre-K through 8, we like to foster students’ love of art while inspiring them to become great artists. Pre-K - 2nd grade work with age appropriate materials such as crayons, washable paint, paper, glue and modeling clay. They learn to express themselves as well as control each medium to create their own masterpieces! Grades 3 through 5 start to explore the elements of design, line, value, color, shape, form, texture and space, in creating artwork. They experiment with a variety of materials such as water colors, tempera, acrylic and oil paint, chalk pastels and oil pastels, ink, and clay. They learn to work together and collaborate on group work. They also learn about famous artists and their masterpieces and learn to create their own masterpieces. We visit art museums to see the work that we talk about in person! Grades 6 through 8 continue to develop the skills worked on in lower grades. The students build upon their knowledge of basic art skills by making effective choices about tools and materials in the creation of art. They develop their personal style while exploring different mediums. Students are introduced to creating work on a pottery wheel and printing using different processes such as linoleum prints and monoprints. We make visits to art museums in New York City. All students are involved in holiday, concert and other school event decorating. Class work is displayed throughout the school. Each student is represented in the Elementary School Art Show. Works are matted and framed to be viewed in a professional manner. Parents and friends are invited to view the great works of art they have created. 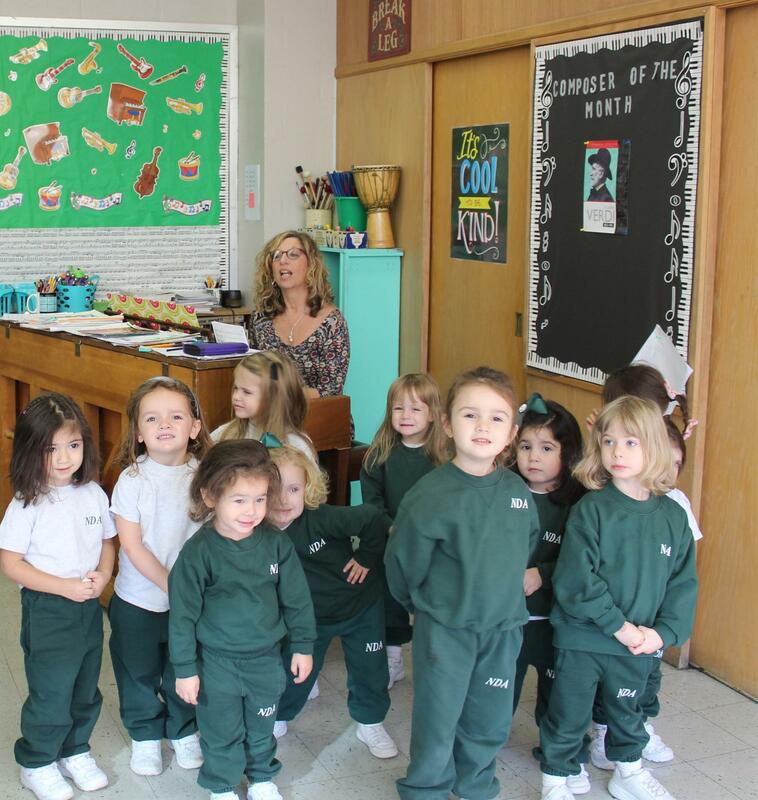 Music at Notre Dame Academy is diverse and exciting. In grades Pre K through 2 the students are introduced to music and motion appropriate for their age but they are also preparing for performance. In preparation for performance even our youngest girls learn to follow a director, sing in groups which encourages great self control and all while having fun. As we progress through the years the music expectations become more challenging. Grade 3 students are introduced to Recorder. This is an opportunity to learn to read music and understand the music theory that is behind playing any instrument from wind to piano to string. It’s a perfect tool for young children to begin the journey of music education toward the focus of playing an instrument. Opportunities for performance occur throughout the year. 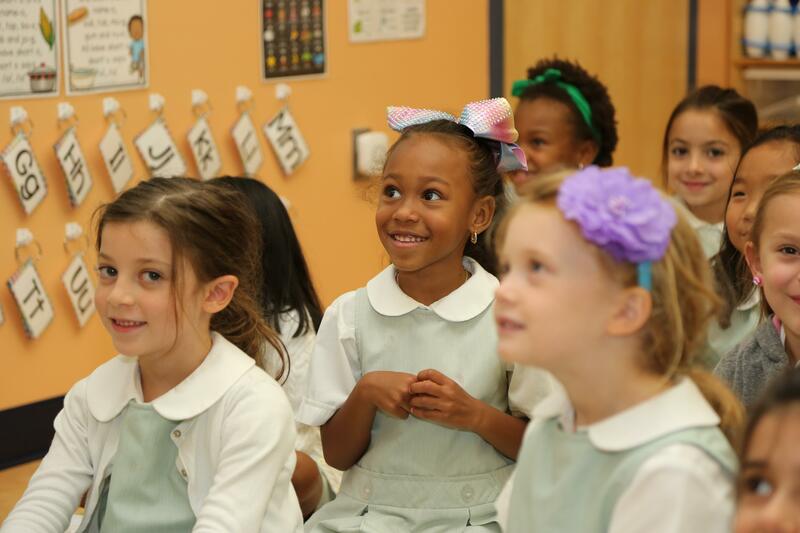 By the time our students reach 3rd grade they are also developing the skill involved to successfully sing in harmony. Although the harmony may be simple at first it is crucial in developing an ear for more complex harmony to follow. Grades 3 - 5 are by this time enjoying the rewards of singing in harmony at all of our performances. Grades 6 - 8 are now developing skills for more complex harmony and are confident and poised performers. These are the years where those students who wish to take music to another level are invited to join Choir. Choir offers opportunities for solos and further reinforces performance and confidence. 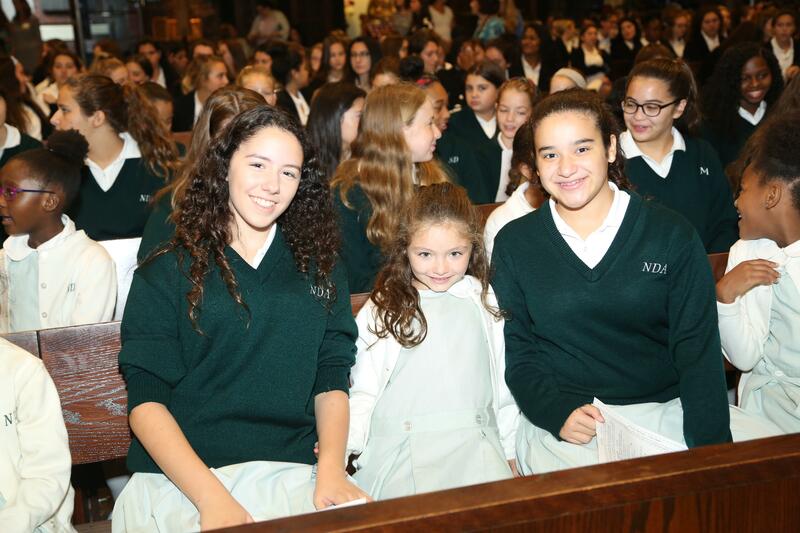 The goal being music appreciation, basic theory, confidence, cooperation and stage presence starts young and develops naturally through the years here at Notre Dame. We strive to create a well rounded young lady with a love of music in a world where there is so much stress and competition. Through music each girl can develop to her own potential and find her own passion. 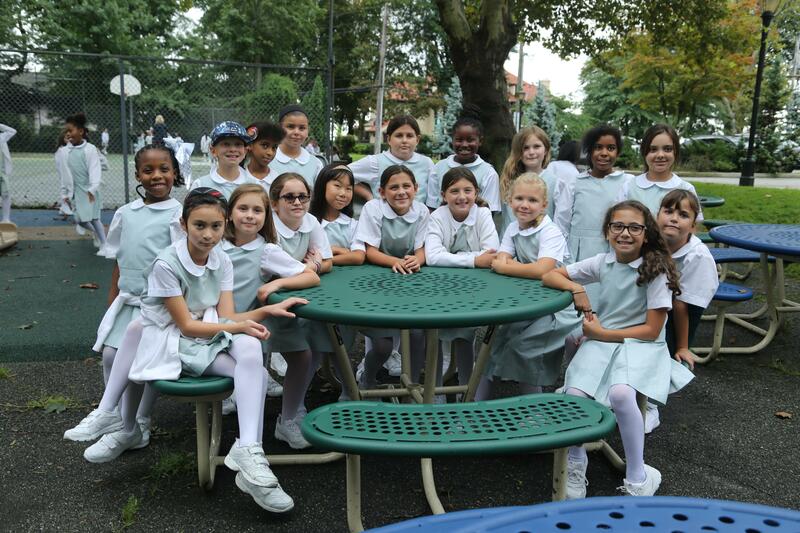 In grades 1-5, the Spanish program is designed to provide an environment that encourages students to participate and explore a new language, progressively moving students to broader, real world application of Spanish, and establishing language activities based on their age group. A caring learning environment that encourages individual confidence is most important at this age and is enhanced by a variety of visually attractive displays. Group based language games, music, and visual arts activities enable students to mimic and repeat simple word phrases. These increase in complexity through the years. In grades 4-5, students take quizzes and tests to reinforce vocabulary and grammar they have learned in class. The students also begin to receive a letter grade on their report card. 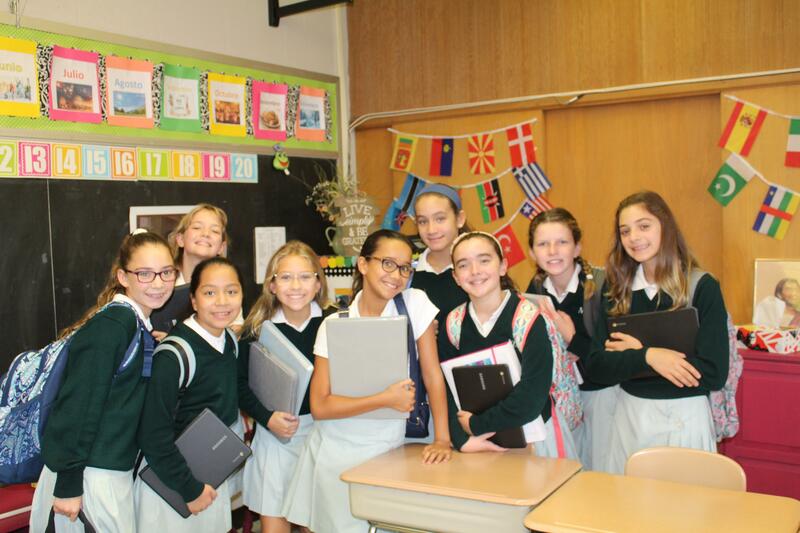 In grades 6-8, the students build on their prior Spanish skills. This is done by expanding their vocabulary, comprehension, speaking and listening skills, while giving them a taste of the Spanish culture. New students to our school, who have had little or no Spanish instruction before, are monitored closely, especially during class. 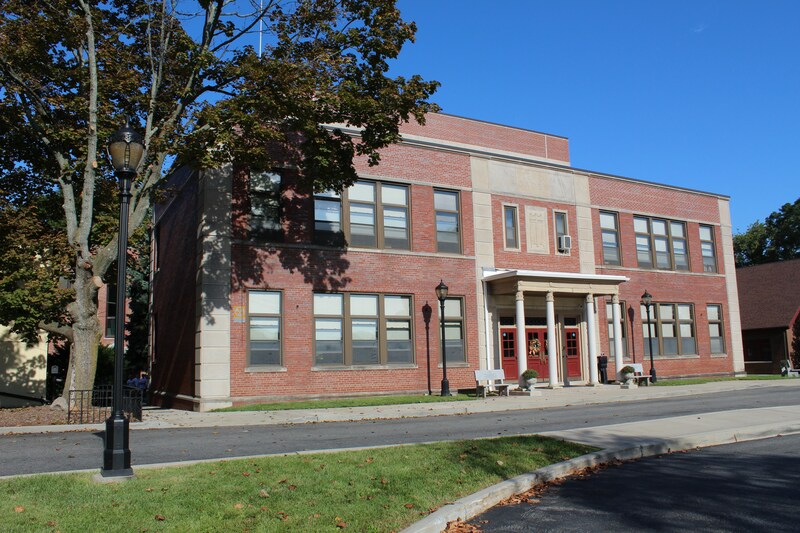 When needed, new students are provided with modified activities, ways of testing and projects to ease their way into the grade level they enter. During class, communicating in Spanish as much as possible is encouraged so as to empower the students with confidence. It is also a practical method to retain the most of what is being or has already been learned. Quizzes, tests and projects are given to reinforce and measure what the students have learned in class. They receive a letter grade on their report card. 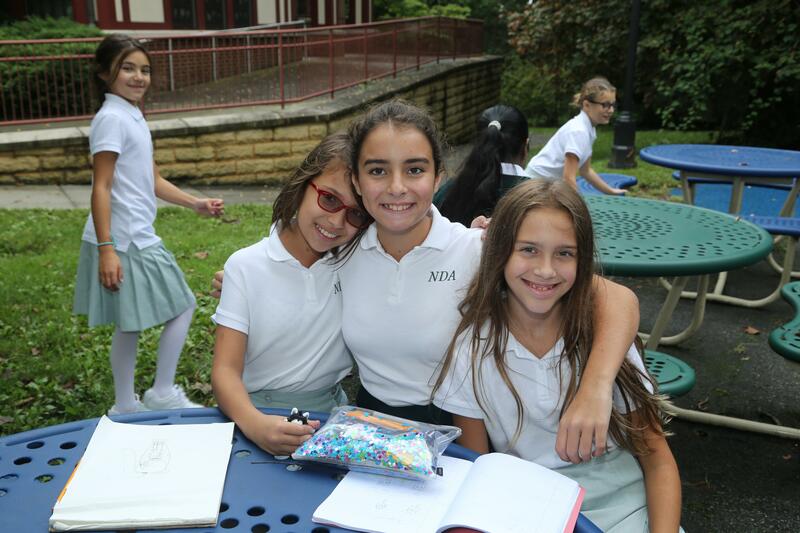 Physical Education at Notre Dame is a challenging yet fun experience for all students. Grades Kindergarten through 4th grade are introduced to team structure and team sports appropriate for their age group. Students learn how to use teamwork and sportsmanship during games and exercises. All students participate in warm-ups, relays, and group games. Students learn all the basics for sports such as basketball, soccer, kickball, softball, and others. As we progress through the years, the workouts and team sports become more challenging but always fun. Grades 5 through 8th, while still learning the importance of teamwork and sportsmanship, are now ready for more complex exercises and team sports. They will develop the skills to be more confident participating in certain tasks and sports. Students learn all skills for volleyball, especially for when they're in 8th grade, and challenge the Faculty during Catholic Schools Week. They participate in sports more in depth and really focus on team building. The goal for our physical education class is to instill confidence, learn to follow directions and rules, learn various sports and team games, learn different types of exercising, all while having a good time and able to express themselves.